Family Fun in San Antonio! In Galveston, we had such a great time chilling out with some of my family. It was a great weekend to just slow down and enjoy our time together. And I’m so thankful for that restful weekend because when we hit San Antonio, there wasn’t much downtime at all! Who knew that San Antonio is such a great place for families? I had no idea there was so much to do. One week didn’t even scratch the surface of all the things to do as a family in this city, but we’ll tell you some of our highlights of that week. When looking for a place to park our home we knew we wanted to be close to downtown because we had so many things to experience while we were there. We were thankful to have friends suggest that we stay at Travelers World in south San Antonio. What a great location - and this park was beautiful! Our kids were so excited about the heated pool. We took full advantage of it being lit up in the evenings. After our long days we’d take the kids down to get the rest of their energy out - we all slept great the week we were there. I thank the pool for that! The grounds are very well kept, it’s quiet in the evenings and really a great place to relax...or in our case, have quick access to downtown. The bus stop is just a short walk across the street and the River Walk runs right along the back side of the RV park. It really is the perfect location to explore San Antonio. We took the kids to the Natural Bridge Caverns and had so much fun on the tour. This isn’t our first cave, but it had some of the best formations that we have seen so far. The tour wasn’t too long and our kids had so much fun. What kid doesn’t love caves? Once you’re done with the tour they also have a ropes course you can check out (our kids aren’t quite ready for that) and they have several souvenir shops as well as a cafe. You could easily spend half a day at the caverns with your family. Also, penny press alert! There were quite a few to choose from. When you’re done there, just make the short drive over to the Natural Bridge Wildlife Ranch. We have actually been to one of these drive-through safari's back in Tennessee but Natural Bridge Wildlife Ranch is a bit bigger. It’s a really neat idea of buying some food for the animals, driving through the grounds (slowly) and rolling your windows down to feed them. It’s neat when they come right up to your car and stick their head through the window. However, you need to know to not get too close to the zebras. Those suckers are mean! They’ll bite you and they’re a bit aggressive. We learned that in Knoxville so when we drove by the zebras our windows were up this time! There’s just something really cool (terrifying) about being eye to eye with an ostrich. We did notice that with our diesel truck being so loud, we seemed to scare off most of the animals. That’s ok though because after we drove through the safari ranch, we parked and walked over to the small petting zoo area. They had a bunch of goats in a pen that we were able to go in and feed. Most everyone liked that, until the head butting started. Then some of the kids got a little bit freaked out and we ended up just dumping the food on the ground and got out of there! They had lemurs and monkeys and peacocks to view. We had a blast that day and I’m sure the kids will remember this place for a long time! Oh, and the wildlife ranch had penny presses, too! We ended up taking the bus into town one day with our friends @takethatexit. We toured Ripley’s Believe It or Not! and the Wax Museum. It was a little scary for our kids and we eneded up walking pretty quickly through most of it. I don’t know if my kids just scare really easily, but we didn’t really enjoy it like I thought they might. Maybe if they were older they may find it neat that a guy can hammer nails into his scull through his nose - but at this age, it just freaks them out too much! However, there was this really cool dance room that we had fun at! We walked to the Tower of the Americas from downtown and went out on the observation deck where we could walk all around the tower and see all of San Antonio. It was really high up and crazy windy but we loved it! They have a small Starbucks at the bottom which was a bonus because we forgot our water and it was HOT that day! Kids had a blast and the grounds around there were really nice. We enjoyed sitting out by the bit water fountains and relaxing in the shade for awhile before making the trek back into town to catch up with friends. Guess what? More Press Pennies! Tower of the Americas had quite a few to choose from. When we made it back to town, we had about an hour to spare before dinner with friends so we decided to jump on the Riverboat Cruise. Jonathan and I actually took this tour when we visited San Antonio last October (without the kids) but it was a much more pleasant trip this time without the loud drunk guy sitting next to us harassing the guide. Sheesh, I was so close to pushing that guy in the water that night. What a jerk! This trip was much better! Our guide told us so many interesting facts about the area downtown. You get a lot of history on these tours which we think is great but honestly, most of the time my kids zone out so I do look forward to the day that they find these facts more interesting. It was still a very pleasant cruise along the River Walk and if you plan on doing it, I suggest an evening cruise. The lights along the River Walk are really pretty when the sun goes down. When we first talked to our kids about traveling full-time, the first place they said they wanted to go was The Alamo! So you better believe we were headed there when we arrived to San Antonio! The kids were so excited! They had played with an Alamo set at Mimi and Papas so they had built this up in their mind for a really long time. I felt so bad for them when we walked up to it and the kids were like, “Is this it? ?” It looked so much smaller than what we had imagined. We walked the grounds and we even got to meet some volunteers that were putting on a special event that weekend called “Evening with Heroes”. If you love history, maybe try to make it to next year’s event. While the kids were a little dissappointed about the size of this Mission, they were still very excited that we had made it there and that they accomplished one of the things on their list to do. Wait for it - more penny press action! Who doesn't want a genuine alamo pressed penny? If you ask my kids their favorite thing from the trip to San Antonio, they may say that this was it! And as for me, the Japanese Tea Garden was my absolute favorite place we visited while there as well. Best part, it is FREE to the public! I’m not sure how. The grounds were so well kept and SO MANY plants and fish to take care of. We loved walking around the gardens, across the bridges and next to the waterfall. We watched bees in the flowers and watched the fish as they’d swim up to us on the bridge and think we were there to feed them. It was just such a beautiful place. So peaceful and the smell...I’m pretty sure heaven will smell like this tea garden! It was so neat to see all the different plants that we had never seen before. This place was so great the kids wanted to walk through it twice just to make sure they saw everything! In my opinion, this is a MUST VISIT when in San Antonio! If your family loves zoos, then you don’t want to miss the San Antonio Zoo. Such a great place and you could easily spend a whole day there. The weekend we were there happened to be the Monarch Fest so that was an extra special treat to go to another butterfly garden free of charge. Our kids love the butterfly gardens and this one makes number 3 for us! We walked around the zoo for a couple hours but it was so hot out (seriously, TX...so hot) our kids were ready to get out of there and find a place to cool off. If you don’t mind the heat and have water and are prepared (we forgot the water, again) it is a great place to hang out for the day. Sidenote: the Japanese Tea Garden is real close to the zoo. We couldn’t find any parking at the zoo so we parked at the tea garden and then walked to the zoo after touring the garden! WIN//WIN Ok - last time - lots and lots of press pennies at the zoo! Guys, if you do nothing else in San Antonio, make sure you walk on the River Walk, or better yet, bike it! We had already visited 2 Missions, the Alamo and San Juan, so we had 3 more Missions that we were determined to see. You can bike to all of the missions (I don’t suggest biking to the Alamo) via the Mission Bike Trail which is also part of the River Walk most of the time. We set out one morning thinking that we would bike to one Mission, then have lunch then bike to the other two. By our calculations it would be around 10 miles which we figured is totally do able as long as Ada rode along in the trailer behind Jonathan. Well, let me tell you something. It wasn’t 10 miles...oh no! We clocked over 17 miles that day! We began our ride around 10am and we didn’t get home until 3:00! It was so hot, Jonathan and I got so sunburned which is weird because I hardly ever get burned. If you plan on biking, leave early to avoid the heat and TAKE SUNSCREEN! Make sure you have water with you, too! We were so happy to see several water fountains along our ride and at each of the Missions we visited! We may have had a water fight with our squeeze bottles! It was just too hot not to squirt the kids! We were so proud of ourselves for riding to the last 3 missions. The kids had a blast exploring them and it was a great day for the ride. We only had one wreck when Jax took a turn too wide and wiped out. He did so good about getting back on his bike and he was fine after the initial shock. The best part of the ride though was when we came upon mile 14, the heavens opened up and sent forth a beautiful authentic Mexican Shaved Ice Food Truck! You know it’s good when you’re the only white folks in line! We were so excited we ordered 2 large Tigers Blood Shaved Ice and they put this magical concoction on top. It was some spice mix that consisted of lots of salt and chili powder which sounds really weird, but it was amazing! The kids also downed a couple of ice creams. They just biked 14 miles, they totally deserved it! We finally got to our RV park along the River Walk and Jonathan jumped off his bike and promptly shouted at me that his leg had just locked up! When he got off his bike seat and put his legs down, his right leg was straight out and I had to help him bend it. It was so weird. All of his muscles in his leg were so tense. I was able to help him bend it and we walked our bike up the hill to the RV park. We were so glad that ride was over. I cried laying in bed that night as my knees began to ache. I never take pain pills but I was begging for some Advil and I don’t think I would have been able to fall asleep without it that night. I'm such an pansy, but when we woke up in the morning we were all even more proud of ourselves for finishing up the Mission Bike Trail and seeing all of the Missions! Go Team Longnecker!! Bonus: There is access to the River Walk right behind Traveler's World RV Resort! Georgous views like this. We just love meeting people on the road. We have been so much more social since traveling fulltime which is weird if you think about it. I think it has to do with having so much more in common with the people we meet on the road. We have formed more friendships on the road then we ever had in our home. We are so thankful for technology so that we can meet people in each state we go to. We hardly ever feel alone. There is almost always a nearby family who is also traveling fulltime and we make it a point to talk to as many people as we can. While in San Antonio there were several of us fulltime families that were able to meet up for an evening. Lots of us set up camp at Travelers World and some came from nearby towns just to hang out with everyone. Thanks to Instagram we were able to meet several families who we had connected with online. It was so great to get to talk to everyone in person. Thanks to @MargaretLeonard for snapping this picture of most of us that night. It was a quick trip and we did so much in just 6 days but we loved this city and we know your family will, too. 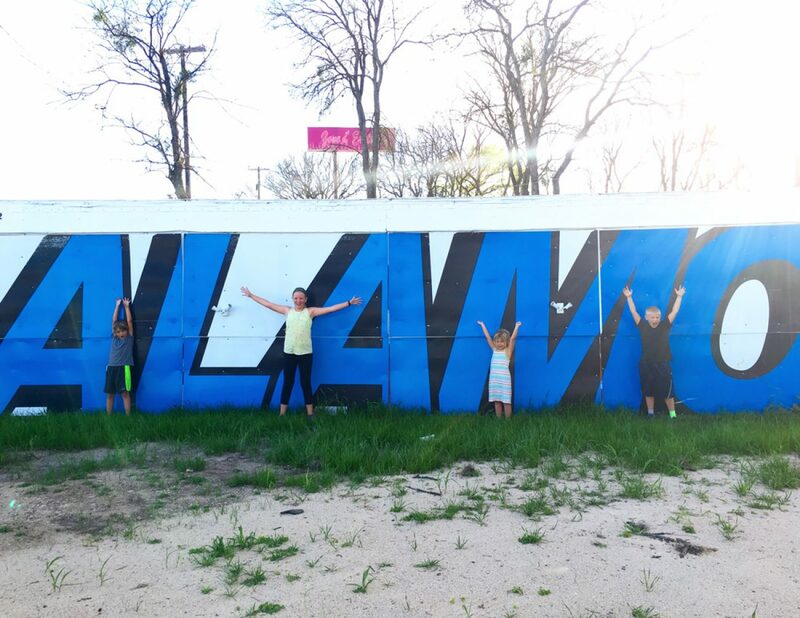 If you’re looking for a convient location to visit the downtown area, Traveler’s World RV Resort is your best option for seeing all San Antonio has to offer for families like ours!